The first industrial revolution began with the invention of the steam engine at the end of the 18th century, and the switch from manual production to automated production. 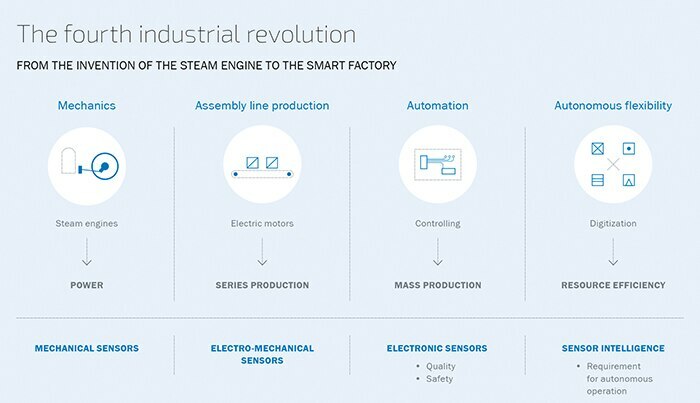 The second industrial revolution followed approximately 100 years later with the development of electrically-powered assembly line production. This has made cost-effective series production possible since the first third of the 20th century. SICK is already a part of the third industrial revolution. It began in the 70s and 80s. Electronic control systems, information technology, electronics, robots, and the increased use of sensors made it possible to further automate production, assembly, and logistics processes. 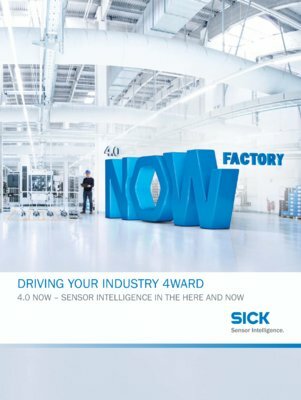 The photoelectric sensors from SICK are already an integral part of these changes, and are used around the world and across many industries. The fourth industrial revolution with its digitization and networking of machines has been changing our lives for some time now. These new technologies have allowed the physical and virtual worlds in production and logistics to merge to form cyber-physical systems (CPS). Since 2011, these developments have been referred to collectively as Industry 4.0. Machines have the ability to communicate with one another autonomously, thereby optimizing process flows. Industry 4.0 clearly relates to networking in the industrial sector. SICK plays a very important role in the value creation chain in this area. The prerequisite for communication is an abundance of information, which is what SICK sensors deliver. Sensor technology is the necessary prerequisite for transparent processes in Industry 4.0. The sensor serves as the foundation for all subsequent applications. Simply put, without sensor technology, there would be no Industry 4.0. In contrast to conventional, non-networked sensors, Industry 4.0 sensors deliver more than just measurement data. Their integrated decentralized computing power and flexible programmability are important characteristics for making production more flexible, dynamic, and efficient.